If you’ve been waiting for my free excel budget spreadsheet for the past 2 years the time has come that you can now download it free. If you have been following Canadian Budget Binder and have read my budgeting series and are still not sure if you want to budget then at least download it and give it a shot for one month. I often talk to fans who email me for budget help but they don’t use a proper budget or one that gives them the data they need to make informed decisions. You don’t need a budget that is so detailed you get lost with all of the information, at least we didn’t. There are so many free budget spreadsheets available on the internet it’s not a one size fits all system. I don’t think there is any one “perfect budget” out there but you can customize an existing budget to fit your lifestyle. I’ve used many online budgets, printable budgets and the pen and paper version so if at first you don’t succeed, don’t give up. You can’t win the battle if you hang up the towel at the first fall. When I put the call out for budget testers back in 2012 I had so many people email me for my excel budget spreadsheet mainly because they saw the screen shot I place in every bust our budget update post and they too wanted to test it out. The only thing I asked of the fans who wanted to test the budget in its beta phase was that they emailed me with any concerns but at the end of the month I wanted them to send me an email with their feedback on the budget. I didn’t care if they hated it, I wanted to know what they loved and where they felt the budget needed improvements. I know from many of the emails that I did receive was that some fans were not comfortable with using an excel spreadsheet which meant errors could easily happen since all of my formulas are left open. Some people are better off with the budget binder where it’s all pen and paper and you keep it nice and tidy in a binder. We did that for the longest time as well before our online excel budget but we do still use our budget binder to keep all of our receipts and documents related to our personal finances for the month. I will do an upcoming post about how we put together our monthly budget binder and bills/receipt book. What I realized over the course of the 2 years of designing and constant change of our budget spreadsheet was that the fans wanted me to keep it simple but have the essentials for them. At the time I offered the budget testers a choice between a free budget spreadsheet without projected expenses or the other with projected expenses. 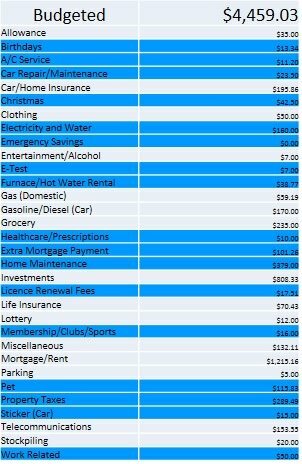 Considering that not everyone saves a little money each month in their budget for those upcoming expenses I was thrilled to read email after email requesting the budget spreadsheet to test with projected expenses. You can read all about what projected expenses are below but just to know that people are thinking about those expenses is crucial to your budget. They need to be accounted for along the way and I don’t care what anyone thinks because if you don’t have the cash when the bill is due you’re stuffed. The money has got to come from somewhere. The feedback I received from every fan that did email me at the end of their test month was both positive and I won’t say negative because it wasn’t bad it was more about making changes to the budget to keep it simple or to accommodate things I had not thought of when designing the budget. 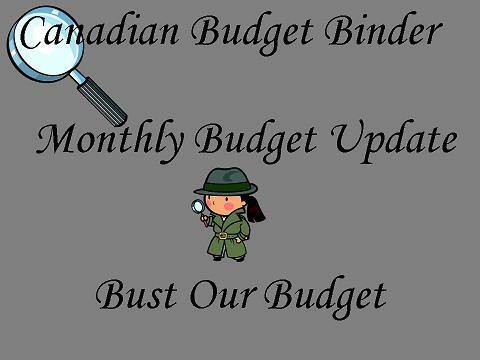 Essentially the Canadian Budget Binder Budget was never intended to be a free downloadable tool until the fans started emailing me for the spreadsheet. I had designed it for our own personal use and trust me what it looks like today is not what it looked like in the beginning. I’m sure if you ask Jen she will tell you she’s still using the earlier version because she got so used to it but what she doesn’t know is come 2014 I’m going to move her into the new Canadian Budget Binder Budget so she can utilize all the updates since being the very first fan to test my budget with success. The new blog design is amazing and if you haven’t had a chance to look around please do. 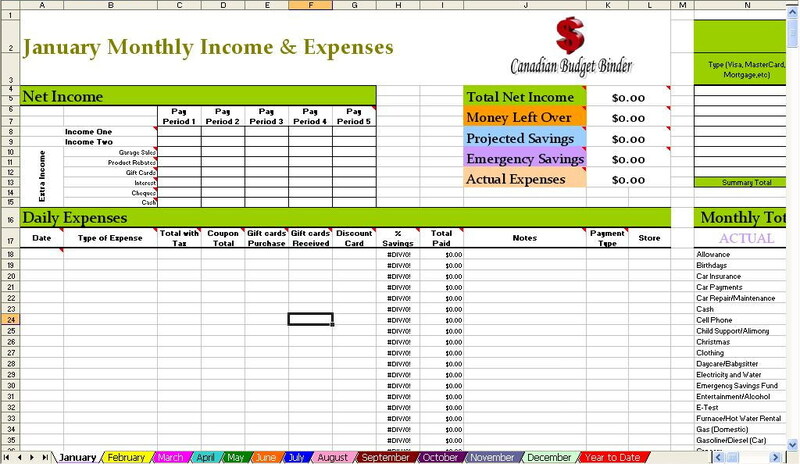 You will notice my Free Money Saving Tools button on the right side bar and that is where you can find all of my free downloadable money-saving lists and the Canadian Budget Binder Budget Spreadsheet. I’m currently offering 2 versions of my budget and the reason behind it is simple. Firstly, read the disclaimer because what you do with it is your own business so if you mess it up you need to sort that out. I have not closed off any cells so you can make all the changes you like to the budget to reflect your lifestyle which is what the fans wanted. This was after all meant to be our personal budget and although I would love to customize it for every fan that wants to use it I’m afraid I cannot. Other than the changes to our Rogers internet in August not too much has changed as far as budget amounts this month. In the beginning of 2014 I am predicting changes in our budget just by looking back over the year at a glance and seeing what we have spent. That is the beauty of budgeting when you can look back and make those decisions based on past performance. I don’t think a budget will ever need dusting off in our house. Our savings of 11.88% includes savings and investments. 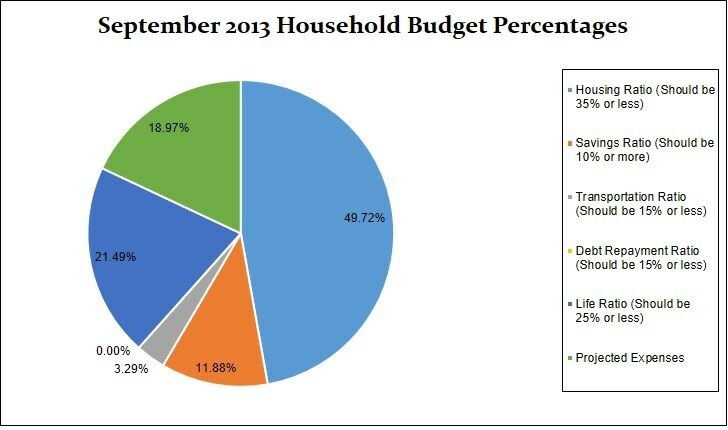 I’ve also went ahead and added in our projected expenses this month at 18.97% which brings the total September 2013 Household Budget percentages to 105.35%. The more than 100% figure occurs due to the $363.97 over spend we had this month. 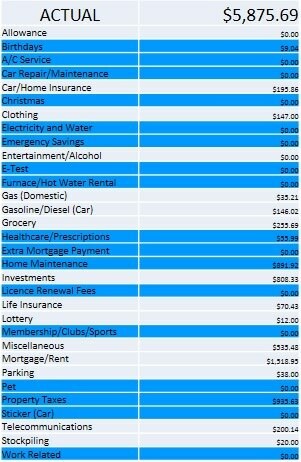 Overall: We had a busy month for expenses for home maintenance and the purchase of a complete home computer system and a new laptop and printer and surround speakers. We also purchased a range hood for $1400 plus tax but only put a $400 deposit on it so in October the remainder will be reflected in our budget. I also finished the landscaping with the purchase of new sod. When we spend the money in a projected expense category we move that money to our chequing account in order to pay for that incoming expense. We pay money into the projected expenses account continually throughout the year even when bills come due as it’s revolving so as one bill gets paid the money continues to come in from the other categories all year-long. So the $1290.44 gets paid into the projected expense account every month no matter what. It seems to be easier to track our money this way but you can do what works best for you. That’s all for this month check back at the beginning of October with a new budget update and who knows maybe some good news. Is there a way for the line items in the liabilities and budgeted columns to automatically transfer to each month? I have many of the same items for each month and this would be a fantastic help. Thanks! I’m glad you’re using the CBB Budget. Yes, as long as you know how to work excel you can create a formula to do this. I left one budget open for this reason so anyone who wanted to customize their budget could do so. I know I can’t help you but I hope you can do it yourself or find an friend who works well with excel. 🙂 Happy Budgeting. Any other questions you can also email me. 🙂 Have a great week. I have been using your spread sheet for a while it is awesome! I don’t know what I would have done without your site and as we regroup to knock down more of our debt this next year I will be utilizing your website heavily. A wealth of knowledge from a good friend who could ask for more? Great information! Im with you on affiliate marketing. That’s one area that I’ve yet to figure out how people are doing so well with that. I’m hoping to learn a lot about that at Fincon! I agree with moneystepper…this is a thorough post! I don’t use a spreadsheet for our budget but it has made a huge difference in our lives. 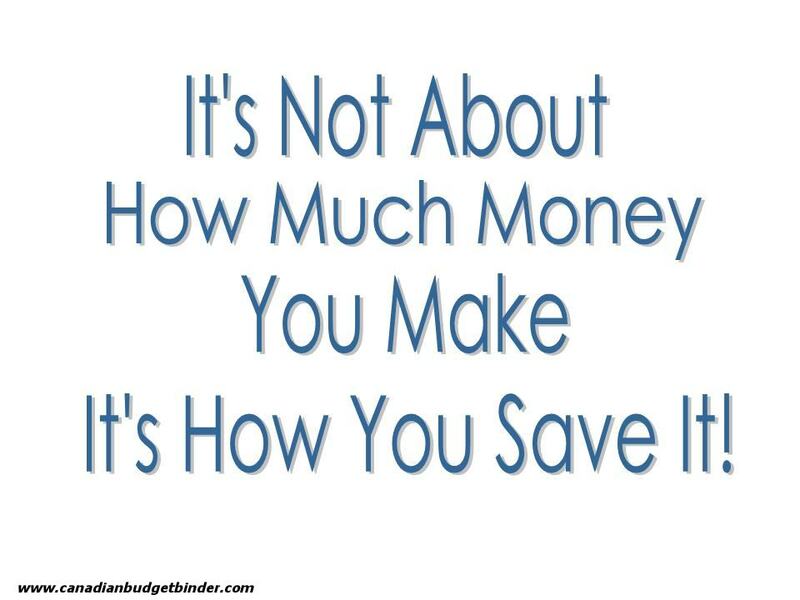 Budgeting brings me face-to-face with all of our spending decisions. No more denial. Wow – what a thorough post. I use Excel to budget and love it. Being able to design something to match your own needs (and make it aesthetically pleasing for yourself) is a great benefit. Good luck with your October goals. Good luck on your October goals! It’s a great time of year to run! It is an awesome time to run. Although I don’t get out to run as much as I’d like I do have a treadmill here so I run indoors as well. I’m so busy and multi-task even though I hate to do that because I’m rubbish at it. I have my own spreadsheet in Google docs, but I’m going to try yours because I bet it’s better. Thanks for sharing. Hey Kim!! Yes, check it out you might like the budget especially since you are a Grocery Game Challenge poster!! I’ve never used excel so I have downloaded both budgets and will print them off when I can get at the printer. look both over and see what I can do with them. I might need a kid to help me but I want to load it onto a thumb drive so I won’t need to haul out the laptop. The older boy uses it during the day and I get it after supper. Plus I use the ipad. I know it’s likely stupid easy but I do know my limits with the computer. Things are looking good with your numbers. Hospital parking is expensive, we know that here from experience!! We all have things on the to-do list that do not get done as quickly as we would like but it’s life. Hospital parking is so bad I hate thinking about it. I might have to write a post about it.. I took photos of the parking box while I was at the hospital. We’ve spent lots of money the past couple of months but it was necessary. There comes a point where things just start breaking down and wearing out and they need to be replaced. I hear you with the parking fees. Stratford is flat rate, $5.00. If I’m going to be there a while it’s one thing but if I’m just popping in for a visit I park on the street around the corners . If I’m going to emergency I pay. London tops out for the day at $12.00. Toronto is $20.00. Amazingly enough in town here is still free parking!!!! Yea!!! The only thing about going to London is we are just far enough away we can claim gas and parking on our income tax. I’m not sure just how far you had to go to take the Mrs to her appointments but I think the distance is 40 km. To claim. Plus you do need the receipt for the parking. Here to Victoria Hospital return is 96 km. Handy info to know if you are like us and making a lot of trips to and from. The hospital gave us a sheet to keep track and we are on our second sheet!! I have a paper clip on it to keep those parking receipts. Our doctor is in town and the other is 30 minutes away so not too far and not too often. Is there a certain amount you need to spend first before you can claim the medical expenses or under what category do you claim these expenses in your income tax? Last year was the first year I did my own taxes. Yes there is a minimum Mr CBB and it’s based on a percentage of your income. For hubby and I it translates to about $1,800 before we can claim. I keep track of all the medical expenses whether or not they are actually claimed. The amount we have for prescriptions that the extended doesn’t pay, the portion of medical & expenses that is not covered by our extended – usually 20% but this year we’ll have my new crown and the mouth guard replacement, the eye glasses and testing not covered by our extended. I have glasses for reading and another pair for the computer but our extended only pays for 1 pair per person every two years so at least one pair of my glasses are not covered. When I was hurt in an MVA hears back… crutches, cane, walker and what not were all deductible. Grab a CRA guide… you may be able to claim some of this years hefty expenses. BUT, I will say, if historically you haven’t deducted medical expenses….suddenly having a hefty deduction is likely to trigger an audit as far back as 7 years. Just be prepared for that possibility. This is such a very helpful post. Thank you very much for sharing this. I love that Canadian Budget Binder Budget Spreadsheet. I think my mom also needs this.